Are you going to be offline for a few hours, but still need access to recent Power BI dashboards? We've got you covered! 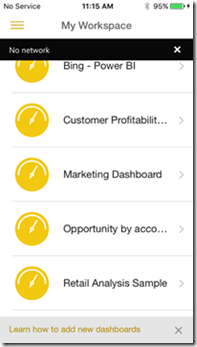 With the latest release of Power BI Mobile apps for Android and iOS, you can view your business intelligence even with limited connectivity, enabling you to make smart decisions while commuting, roaming, or even just going through an area with poor coverage. The new app updates your dashboards every couple of hours and caches them for future use. With this cache, you can reference Power BI while offline and feel confident that your insights are no more than a few hours out of date. There's no need to prepare for an offline period – updates occur automatically in the background while you do your work. Note: Offline is currently available on iOS devices and Android phones, but not yet on Windows devices. Some features and data are not yet available in offline mode. These include interacting with special tiles (such as Bing or custom tiles), sharing dashboards, and viewing any group data that you did not previously open in the mobile app. Knowing when you are working with live data and when you are using cached dashboards is now more important than ever, so we've added a clear indicator for offline mode. The "No network" notification bar will be visible whenever you're offline. While it's visible, you'll know that you're working off previously updated elements. In cases where specific dashboards are not available while offline, you will get a clear indicator explaining why access is missing or limited. To learn more about this new feature, please refer to our documentation on offline capabilities.